Released early in August, the new H.E.R. EP, I Used to Know Her: The Prelude, arrived on time. After putting out several EPs since 2016, I Used to Know Her is revving up the California-raised musician’s fanbase—which now includes Rihanna, Drake, and Kylie Jenner—for her upcoming debut album. H.E.R. pronounces the “pre” in “prelude” like the “pray” in “praying.” And there is prayer there; the EP marks those quotidian acts that preserve the spirit. 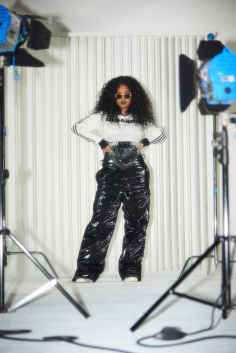 Before changing into the looks for her SSENSE photoshoot in Brooklyn, H.E.R. comes to set in her own clothes, wearing a black top splashed with white letters: “Find Your Way.” Appropriate, it seems, because she almost speaks in 1990s maxims—it’s about the music, it’s the evolution of me, it’s all part of a bigger picture—but the kind that make you feel warm and at ease in heartbreaks big and small. We sat down and talked about music. Plain and simple. H.E.R. wears Balenciaga crewneck. Featured In Top Image: Y/Project jacket and Junya Watanabe leggings. The title of the new EP suggests the project is a prelude to your full album. I’ve been on tour for the past year. Like, literally the past year. I did the Bryson Tiller tour in August of last year and I haven’t had too much time to finish my album. You know, I haven’t released music since Vol. 2—only little things here and there. I’ve really wanted to give something in the meantime. It’s a little preview because people have been asking me. It’s a snack for the fans. What does the first part of the title mean? I immediately thought of Common’s 1994 song, “I Used to Love H.E.R.” Is there a reference? There’s no reference there. “I Used to Know Her” means multiple things. It’s really me getting back to my younger self. This album and this project is all part of a bigger picture. It’s my perspective in life, on everything: relationships, love, the state of the world today, everything—until now. At one point, I was was like an underdog, waiting my turn, and everybody was like, pushing me to the side or underestimating me or thinking, like, “When is she ever going to come out?” And now those people are like, “Oh, I used to know her, I used to go to school with her.” It’s all that happening. H.E.R. wears Jil Sander t-shirt, Gosha Rubchinskiy polo and MM6 Maison Margiela boots. A lot of the songs on the EP reminded me of romance’s relationship to time: “Be On My Way” is about anticipation; “Could’ve Been” is about what-ifs; and “As I Am,” is about accepting the present. I love that. And, as you mentioned, the title, I Used to Know Her brings up the past. You grew up in the Bay in a musical family—what were some early experiences with music that you have carried with you? There are so many. Every day I look back and think, wow, everything happened for a reason, which is a beautiful thing. I remember mornings waking up to Prince concert DVDs and B.B. King, my dad making breakfast in the morning while he’s watching the MTV Unplugged Lauryn Hill project, coming downstairs and smelling breakfast and looking at concert DVDs. What kind of food would you eat at home? Everything. I mean, my mom is Filipino so a lot of Filipino food. My grandparents lived with us. But my dad, he makes a lot of soul food. Everything. He’s amazing. He has the best fried chicken. I’ve never had anybody’s fried chicken that was better than my dad’s. That domestic scene is beautiful. It’s moments like those that really were so important to me, and that contributed to me being so passionate about my live show. I would watch and study Alicia Keys’ Unplugged album. Earth Wind and Fire. Everybody. Being a young girl playing the piano, playing guitar, playing the drums and bass on stage with my dad at a young age is preparation for now. Back then I knew exactly what I wanted to do and I stayed on the path. What’s your writing process these days? It’s everything. It’s never changed, whether a melody comes in my mind and I have to record it real quick so that I don’t forget, or just talking. I talk and listen back to voice notes and write it down. Sometimes a song just writes itself. Sometimes I’m at the piano. Sometimes I’m on the guitar. Anything goes creatively, with me. I don’t have one way of doing things. I really like to talk. I like to talk to people. I love to talk about my stories, which is why when I collaborate with people I have to be comfortable with them. I have to have some sort of personal vibe with them, because I’m telling them everything about me and the things that I go through. The Daniel Caesar collaboration seemed very fluid in that way. Yeah. It was organic. We recorded that song the first day we met. I was in the studio and I actually had another session but the person I was working with left early. The session was kind of cut short and I was still in the studio and I still wanted to work. He came in with somebody else and they were like, “Hey, H.E.R.—Daniel.” We started sharing music, just talking about life. He had his guitar, I had mine and we were just jamming out, just talking, and it just happened. Organic. We weren’t even supposed to create. We were just meeting, and talking, and we created that song. It’s rare, but when you don’t have an expectation to create, when it’s like, “I’m not trying to serve a purpose here, I’m just going to create”—that’s when the most beautiful things come out. It’s good. It’s going to be a continuation of The Prelude—but elevated. I’m constantly changing. It’s the evolution of me. It’s definitely more musical. What does “more musical” mean? More organic sounds, more bass lines, more—I don’t know—more sounds that aren’t with the times. It’s not something that is current, it’s not something that is past, and it’s not something that is in the future. It is something hopefully people will believe is timeless. Tiana Reid is a writer, doctoral candidate at Columbia University, and editor at The New Inquiry.